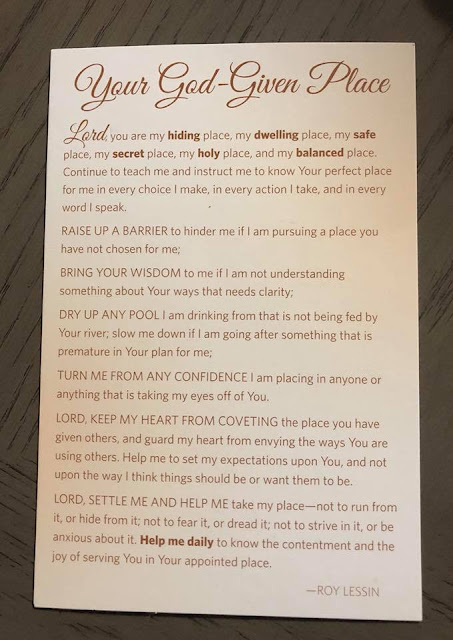 Lord, you are my hiding place, my dwelling place, my safe place, my secret place, my holy place, and my balanced place. Continue to teach me and instruct me to know Your perfect place for me in every choice I make, in every action I take, and in every word I speak. TURN ME FROM ANY CONFIDENCE I am placing in anyone or anything that is taking my eyes off of You. LORD, KEEP MY HEART FROM COVETING the place you have given others, and guard my heart from envying the ways You are using others. Help me to set my expectations upon You, and not upon the way I think things should be or want them to be. LORD, SETTLE ME AND HELP ME take my place—not to run from it, or hide from it; not to fear it, or dread it, not to strive in it, or be anxious about it. Help me daily to know the contentment and the joy of serving You in Your appointed place. ©2018 Roy Lessin, Meeting in the Meadow, all rights reserved.